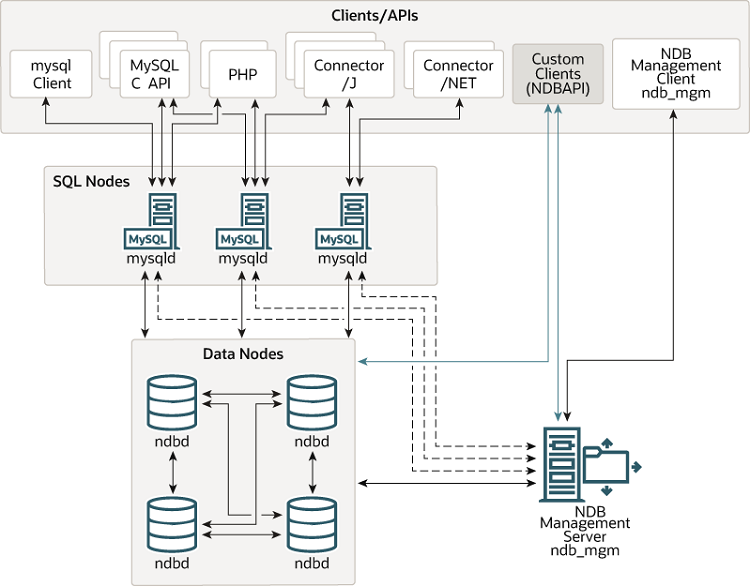 Although an NDB Cluster SQL node uses the mysqld server daemon, it differs in a number of critical respects from the mysqld binary supplied with the MySQL 5.6 distributions, and the two versions of mysqld are not interchangeable. Backing up and restoring NDB Cluster databases can be done using the NDB-native functionality found in the NDB Cluster management client and the ndb_restore program included in the NDB Cluster distribution. For more information, see Section 7.3, “Online Backup of NDB Cluster”, and Section 6.22, “ndb_restore — Restore an NDB Cluster Backup”. You can also use the standard MySQL functionality provided for this purpose in mysqldump and the MySQL server. See mysqldump — A Database Backup Program, for more information.